MEN'S WEDDING RINGS : BRITISH Made : LOVE2HAVE in the UK! The BEST! men's wedding rings made in the UK. 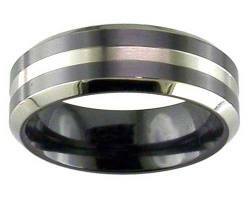 In this category, we decided to feature mainly our two-tone or twin finish zirconium rings. Zirconium is a very similar metal to titanium, and what is excellent about zirconium is that it can be turned all black and machined into a two-tone design, something we think makes a great alternative; something exciting and dynamic that just screams men's jewellery. Just like titanium, these rings can be personalised on both the inside and outer edge using laser engraving technology. Zirconium also offers more flexibility in design styles and finishes, is more affordable, and certainly more durable. Its versatility can be found on our men's Celtic rings, and our men's diamond rings too. Durability is essential as men tend to be much more substantial on their wedding rings than women. Do remember though that no metal is scratch proof and you must look after your wedding ring if you want it to continue to look good for many years. Enjoy top quality at unbeatable value! On a final note we are very confident in that not only do we provide the BEST wedding rings for men made here in the UK (and probably the world) but also at the LOWEST PRICES too. If you think you may have seen the same men's wedding ring elsewhere at a lower price, let us know, and we will price match like for like. YES! We can BEAT anyone!